These have been setup as per my previous guides. 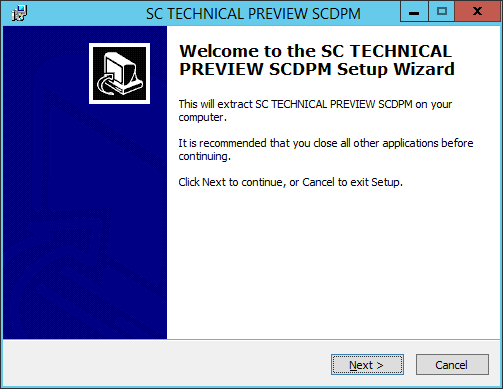 IMPORTANT: In order to evaluate the System Center Technical Preview, youMUST be using the Windows Server Technical Preview, and SQL Server 2014; as per the following TechNet article: http://technet.microsoft.com/en-us/library/dn806369.aspx. Start by copying the EXE file into the SCVMM VM. 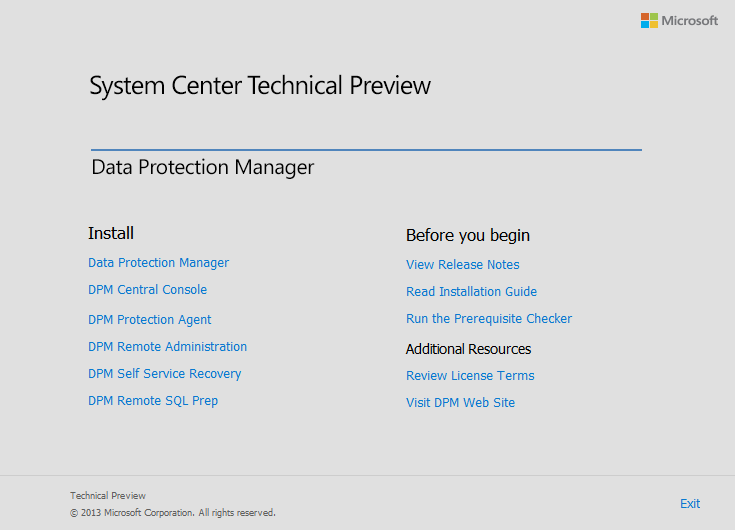 As of this writing, the Technical Preview EXE is labelled as “en_system_center_technical_preview_data_protection_manager_x86_x64_5650540.exe“. Start by running the EXE, on the first screen, click Next. On the Select Destination Location screen, specify the location that you want the files to be extracted to, then click Next. On the Ready to Extract page, click Extract. Once the extract is complete, click Finish. Now, navigate to the extraction location, and run the Setup.exe file. 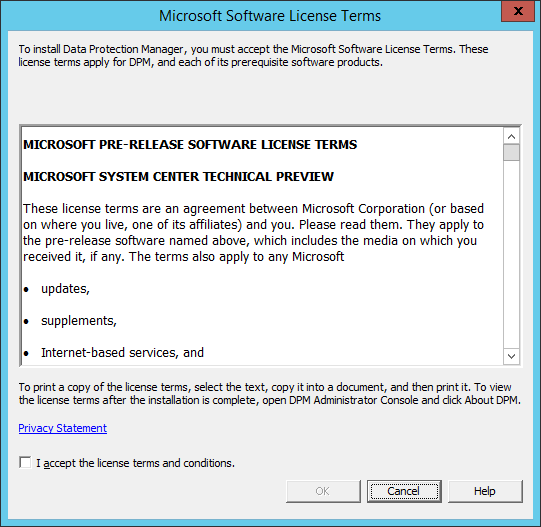 On the License Terms page, accept the agreement and then click OK.
On the Prerequisites Check page, choose what type of database DPM will use; either a stand-alone SQL Server, or a clustered SQL Server. Basically, will it use a local SQL install or a remote install. Since we are doing this in a lab, I will choose the ‘Use stand-along SQL Server’ option, and use a local SQL instance on the DPM server. Make your choice and then click Check and Install. 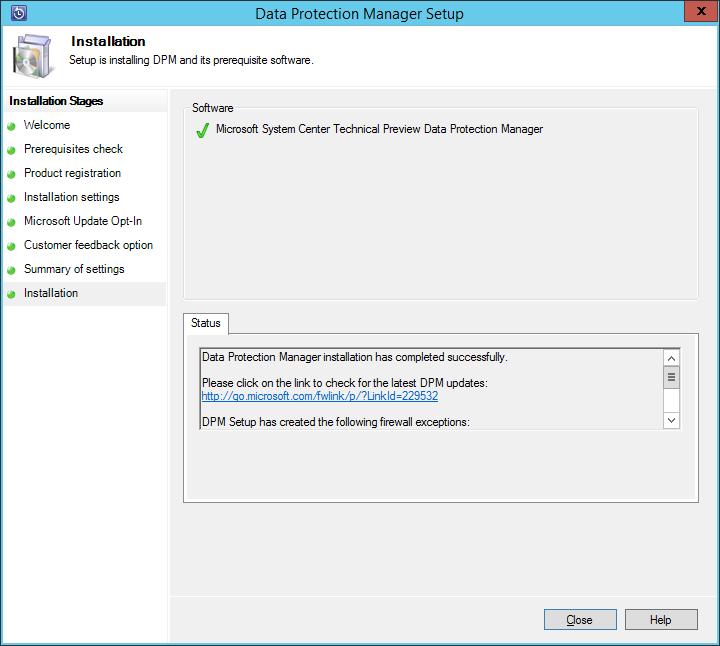 The Prerequisites Check will check the system for any issues preventing installation. If there are issue, you will need to resolve them prior to being able to continue with the installation. Once you are able to continue, click Next. On the Product Registration page, enter a User Name, and Company, then click Next. Unfortunately, I am not aware of any way to install an evaluation version of the application, although all other System Center products provide this option. 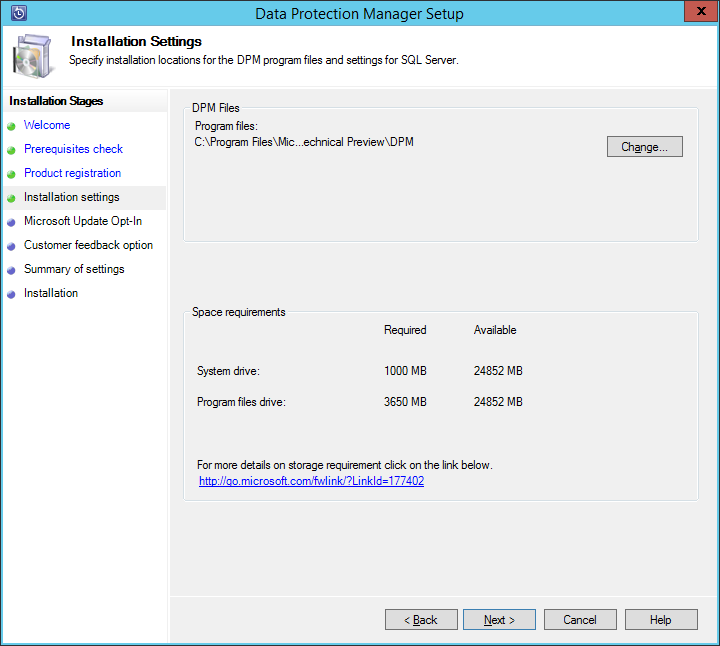 On the Installation Settings page, you can specify the location to install DPM. Make any changes required and then click Next. 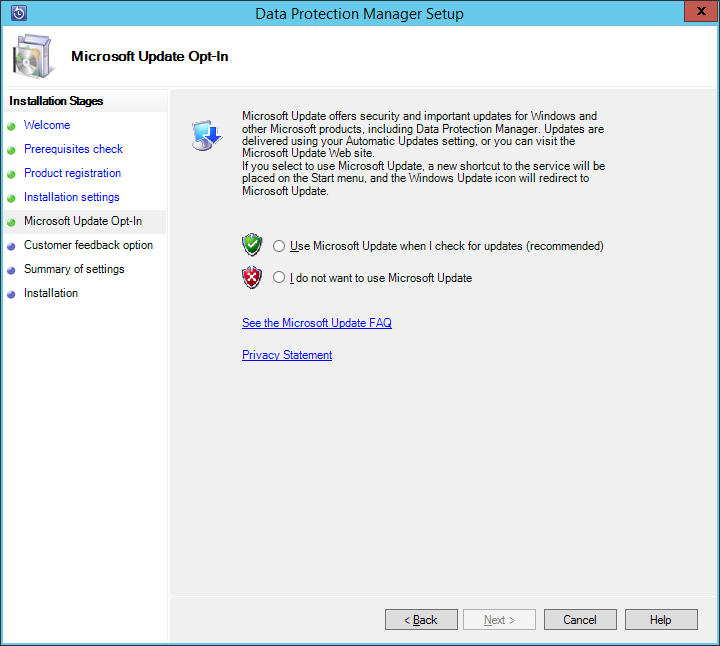 On the Microsoft Update Opt-In page, choose if you want to include the product in Microsoft Updates, then click Next. 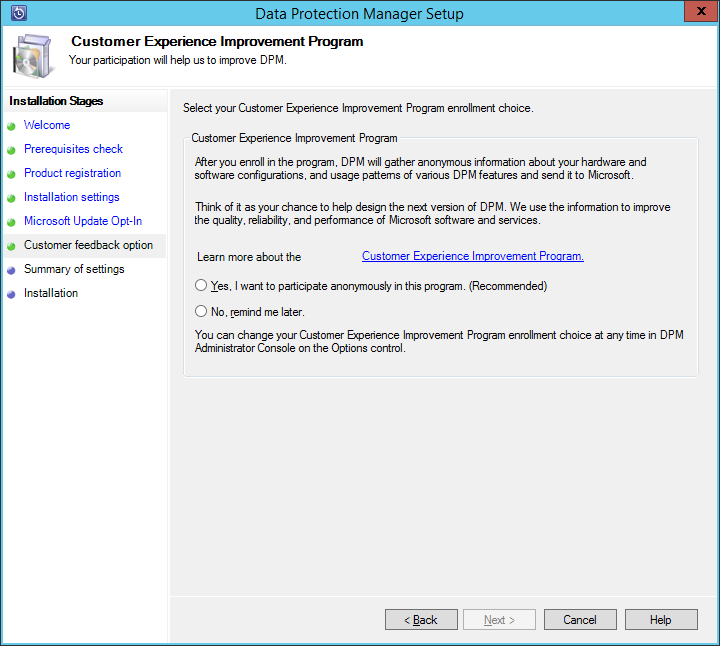 On the Customer Experience Improvement Program page, you can choose if you want to join the CEIP program or not. Make your choice and then click Next. On the Summary of Settings page, review the selections/choices made, and then click Install. 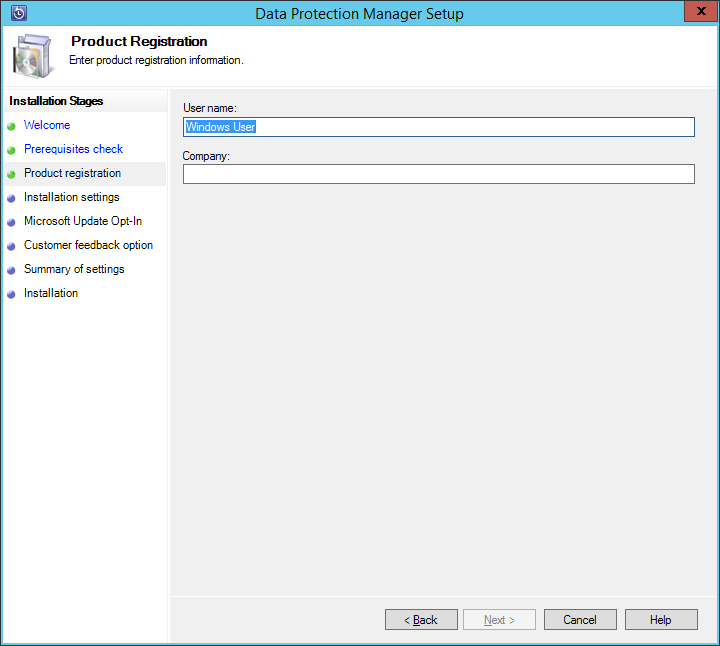 Once the Data Protection Manager Setup wizard is closed, it will automatically launch Windows Update and check for updates. The SCDPM console will launch. Navigate around the various areas. 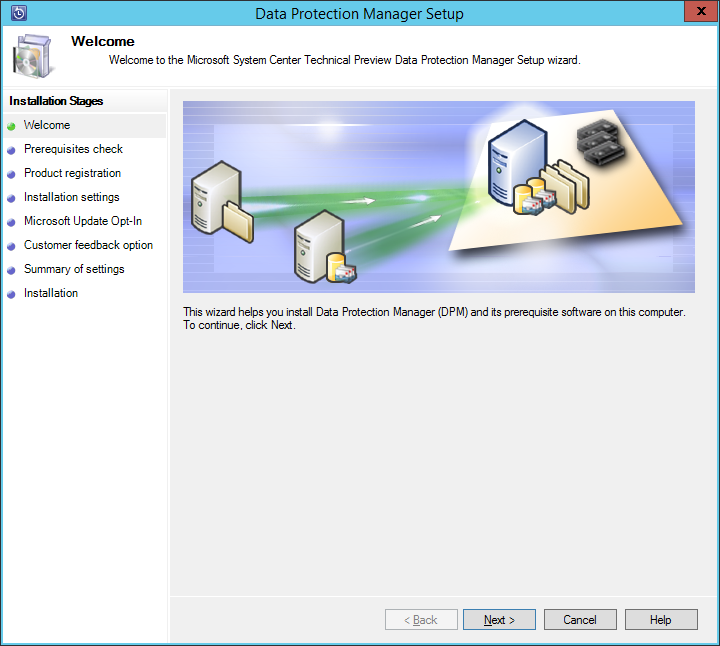 Congratulations, you have now successfully installed the System Center Data Protection Manager Technical Preview. 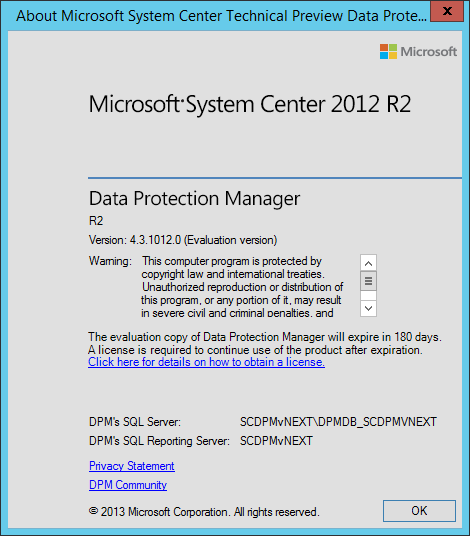 As you can see from the About screen, the version of SCDPM, even though it shows “System Center 2012 R2”, the version is: 4.3.1012.0 (whereas the actual 2012 R2 product is version 4.2.1235.0).